This tree was left in the middle of the street on Garfield Pl. This is the only street in Monrovia that I'm aware of where this is the case. Anyone know of others? I have a photo of a tree in the road in Jamaica. It's not quite in the path of the road as this one is, I'd guess about a foot into the road. Still, a very strange site to see. 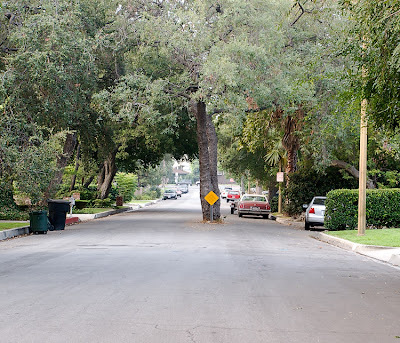 There's an oak tree in the middle of Louise Ave in Encino, CA.